Los Angeles has become the first city in the U.S. to deploy an earthquake early warning app for the public. 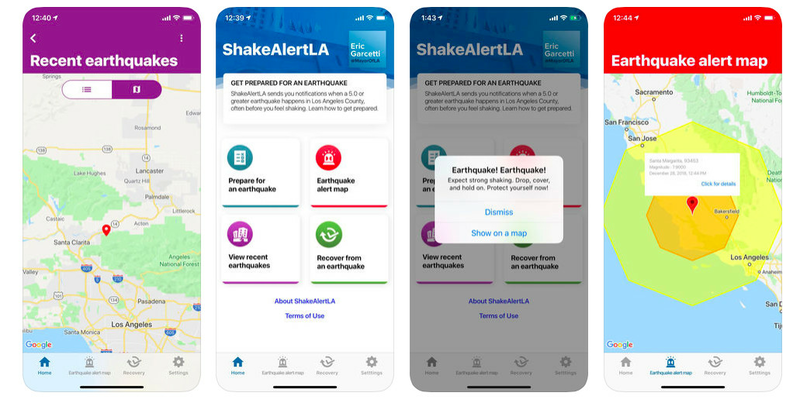 The app, called ShakeAlertLA, uses a network of seismic sensors distributed throughout the region to detect earthquakes and dispatch a warning to smartphones when shaking is expected in Los Angeles County. It was developed by Mayor Eric Garcetti’s office in partnership with the U.S. Geological Survey, AT&T, and the Annenberg Foundation. Garcetti made an official announcement about the app at City Hall on Thursday, but the app has been available to download in the Apple and Android app stores since December 31. The app is available in English and Spanish. Alerts are only issued for earthquakes that are magnitude 5.0 or larger when shaking will be felt in the Los Angeles area. At the press conference Thursday, Garcetti noted that the app might provide “precious seconds” for earthquakes epicentered closer to LA. But for a large earthquake epicentered on the San Andreas Fault, most Angelenos would have up to a minute’s warning. In addition to the warning, the app features maps of recent local earthquakes and LA-specific information about how to prepare for and get help after a major quake. Screenshots from the ShakeAlertLA show how Angelenos will receive advance warnings for earthquakes. For more than a decade, the USGS has worked with a group of universities and research institutions to secure funding and build out the sensor network for the ShakeAlert program, which distributes the seismic data to the City of LA’s app. The initial goal of the ShakeAlert system was to create an early warning system for the entire West Coast, but federal dollars to pay for development were repeatedly zeroed out during budgeting. Other countries like Mexico and Japan have had similar apps in place for years. These early warning systems have been credited with preventing serious injuries and deaths in advance of major quakes. In his 2017 State of the City address, Garcetti promised that an early warning app would be in the hands of Angelenos by the end of 2018. 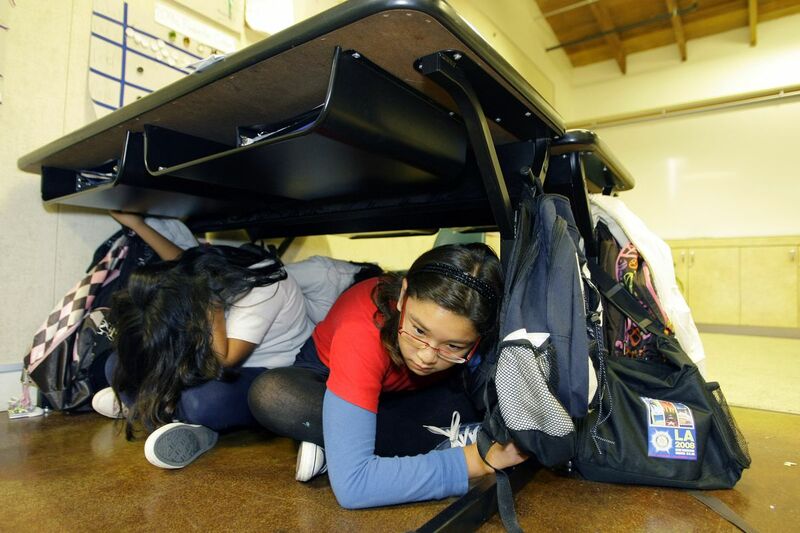 A handful of local organizations like Metro, NBCUniversal, and LAUSD have already been using the real-time ShakeAlert data. In Metro’s case, the agency conducts regular drills where trains are slowed or stopped, which could prevent derailments in large earthquakes. Hunter Owens, the city’s data scientist, noted on Twitter that the app’s code has been made open-source for other cities or states to use. Another early warning app in development by Santa Monica-based Early Warning Labs which also uses ShakeAlert data has been shared with a group of beta-testers for over a year, some of whom have received up to 30 seconds of warning for recent earthquakes. That beta app, named QuakeAlert, features a customized, location-based countdown depending on how far away the user is from the earthquake’s epicenter. The ShakeAlertLA app does not have a countdown feature. After the state’s most devastating wildfire season, where evacuation notices and other wireless alerts intended to save lives did not reach people who were in danger, early warning systems have been heavily scrutinized by officials who worry that only some people will get the alerts—or receive the wrong information. Even established earthquake early warning systems like Japan’s have issued false alarms. One of the biggest challenges for an app like ShakeAlertLA is relying on existing smartphone carriers to quickly deliver the warning using cell networks which are easily overwhelmed. Last year, the city of LA partnered with AT&T to allow more than 48,000 city employees to receive the beta alerts locally. Once ShakeAlertLA is tested at the regional level, USGS plans to expand the warning system to the entire West Coast.